RadDataGrid allows editing an already populated items through the UI. First, the RadDataGrid.UserEditModeshould be set to DataGridUserEditMode.Inline. The user can begin an edit operation over a row by performing a double tap gesture over a cell or by clicking the F2 button from the keyboard(begins an editing operation over the current row). 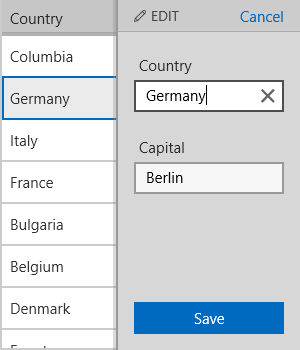 The user can cancel an edit operation over a row by clicking the Cancel button of the Editing UI or by clicking the Esc button from the keyboard. The user can commit an edit operation over a row by tap/click over another cell or by clicking the Enter button from the keyboard. First, the RadDataGrid.UserEditModeshould be set to DataGridUserEditMode.External. The user can cancel an edit operation over a row by clicking the Cancel button in the external editor UI. The user can commit an edit operation over a row by tap/click the Save button in the external editor UI. BeginEdit(object item): Begins the edit operation for the specified data item. CancelEdit(): Cancels the current edit operation. CommitEdit(): Commits the current edit operation.